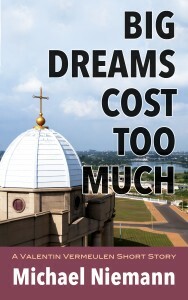 Big Dreams Cost Too Much (Kindle Single, $2.99) is a novella featuring Valentin Vermeulen, a United Nations fraud investigator who is featured in two other short stories and two full-length international mystery/thrillers, Legitimate Business and Illicit Trade. Book 3, Illegal Holdings, will be released on March 1, 2018. Sent to a peacekeeping mission in the Ivory Coast, West Africa, Vermeulen clashes with a beautiful but ruthless widow. The story that introduced Valentin Vermeulen, “Africa Always Needs Guns,” is also available exclusively on Amazon for $.99. United Nations Investigator Valentin Vermeulen has been sent to a peacekeeping mission in the Ivory Coast, West Africa. After falsely accusing a higher-up at the UN, he is relegated to ferret out a suspected fraud in the miserably wet, politically volatile city of Yamoussoukro. A large amount of fuel has gone unaccounted for, and the culprit seems to be a petty bureaucrat named Khoury. But after Vermeulen confronts the man, he is shot and his death declared a suicide. Vermeulen knows Khoury’s death was no suicide. He heard the gunshot and saw a young thug leave Khoury’s office. The suicide note did not appear until later. Vermeulen’s search for answers takes him to the offices of a beautiful widow, Desirée Doué, who runs a cocoa export company. For security, Madame Doué employs a group of young hoodlums known as the Jeunes Patriotes, and Khoury’s killer is one of them. Obviously someone in the UN is in league with her, but with the city’s politics in disarray, how will Vermeulen stop the perpetrators and remain alive? Fortunately he has an ally, Kwame Appiah, a member of UN troops with a trick or two up his sleeve. Michael Niemann grew up in a small town in Germany, ten kilometers from the Dutch border. Crossing that border often at a young age sparked in him a curiosity about the larger world. He studied political science at the Rheinische Friedrich-Wilhelms Universität in Bonn and international studies at the University of Denver. During his academic career, he focused his work on southern Africa and frequently spent time in the region. After taking a fiction writing course from his friend, the late Fred Pfeil, he embarked on a different way to write about the world. Her smile thinned in response to my gibe, but she retained her composure. Taking my hand, she led me to a chair in front of the desk. Her flirty demeanor seemed out of place in this well-appointed office. The dark wood, the generous seating area off to one side of the desk, and the leather chairs all radiated a more masculine type of power. She held up her hands, palms out, like a patient teacher. That explained the office décor and the framed photograph hanging on the wall behind her under two crossed spears, depicting an older African man with white hair.